Bleach and softeners eliminate static charge. Softeners deposit a coating on the fibers which lead to loss of absorbency, cleaning power, and streaking. Microfibers are not to be washed with any cotton or textiles of any sort, strictly microfiber loads (applicator, bonnets). Cotton, or say steel wool, will simply detach their fibers and destroy the fibers by filling them with lint. If you happen to cross mix: try the Boiling Method and decontaminate your microfibers with a few washes. This MIGHT aid the problem. Microfibers should not wrinkle unless very wet, usually they flatten and are absorbent. If you fold into each microfiber into quarters you should have no problems. You should have 3 group of towels: paint delicates, all-purpose, and specialty. Paint friendly towels (Quick Detailing, Buffing, Drying) are the most delicate since they are the only objects touching your paint. Non paint towels would include all-purpose (wheel jams, wheels, metal work, engine), and interior towels. These are essentially downgraded towels not meant for delicate surfaces. Specialty towels such as glass, waffle weaves, and suede can be also separated. You can use an all-purpose cleaner to spray on exceptionally dirty spots. Inspect your laundry load to ensure light or heavy microfibers are not cross contaminated with non microfiber towels or exceptionally grimy towels. You may create a heavy APC/Chemical solution to pretreat towels and dwell them overnight or for 1 hour. Use Meguiars Super Degreaser, Optimum Power Clean, Charlie Soap Laundry Detergent/All Purpose Cleaner. Pretreat your washer with a quick white vinegar or laundry cleaner such as Charlie Soap to remove any residue in the laundry washer. I recommend 120F to 200F. Korean manufacturers suggest you wash at 60 Celcius. Just make sure the water is WARM to HOT. Consumer laundry machines are unable to melt the fibers (the temperature to melt polyester is 500F), so don’t be afraid to use mild to hot temperatures. Heat does ensure the release of dirt and contaminants. Extreme high heat can cause shrinking of polyamide or polyester, however most household water heaters do not exceed 140F. You will want a clean “free” rinsing detergent, no powders that leave residual crystals, no bleach, no softener, no perfumes. You may add all-purpose cleaners or degreasers such as Optimum Power Clean or Super Degreaser. Try to avoid harsh alkaline cleaners. Use about half the recommended amount of normal detergent, less is more. 1 – 2 Ounces per Standard Laundry Microfiber Load, observe manufacturer recommended dosage. Most specialized microfiber washes are degreasers with scents to be more consumer friendly. MicroRestore has surfactants and emulsifiers to remove stains. As well it contains water softeners to reduce mineral deposits. 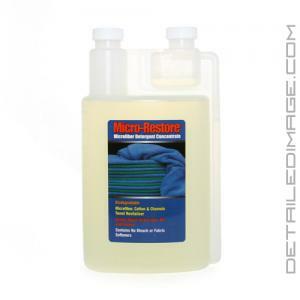 MicroRestore is simply a strong modified degreaser (specifically it’s a modification of a garage degreaser and wheel cleaner, no cause for concern however). White Vinegar is a natural softener and rinse aid due to the acetic acid that breaks down any leftover residue from detergents or chemicals. White Vinegar has been used in the past as a natural softener and natural multipurpose cleaning chemical. It has many applications such as water spot removal and chemical cleaning. 1 Teaspoon per Towel in the Rinse Cycle. Most people just add 1/2 cup to 1 Cup per load. Pakshak does not recommend the use of vinegar in frequent or large doses in your washing routine since it can leave residue that induces repellency. Too much will give you a crust like effect on your fibers. An extra rinse cycle is good; both before and after your microfiber load. Before you start your microfiber load, run white vinegar in a quick rinse cycle to remove any prior detergents or residue. For your final cleaning regimen, run white vinegar again to ensure no detergent, waxes, residue, or chemicals remain in the fibers. While your residential laundry dryer cannot melt your microfibers, (some distributors believe so, but again the heat index is not possible by normal equipment) high heat overtime reduces the life of your microfiber significantly. Due to the high electrical charge that occurs when drying on high heat, microfibers are seriously damaged and lose their natural absorbency properties. Tumble dry or delicate dry your microfiber loads. The best practice is to simply line air dry. If you use a dryer, microfibers dry significantly faster (1/3 time wise) so be careful. Color Bleeding: It is common to have color bleeding after the first or second wash. This doesn’t compromise the cloth since the dyes are filtering out. You may want to separate each color. First Wash: It is preferable to wash your microfibers before their first use to ensure no contaminants from the factory or transportation remain. Drop it, Demote it: If your happen to drop your microfiber during your detail, simply throw it aside. Grains of dirt, sand, or contaminants become attached to the microfibers and should be washed right away. Pollen and leaves are also dangerous. Overtime some microfibers do get saturated with dirt and grime, I suggest demoting these to all-purpose tasks such as wheel or interior duty. Storage: it’s best to store you microfibers so that no dirt or contaminants can be absorbed. Store the microfibers using zip lock bags or in plastic containers after a wash.
Boiling water breaks down the build up of chemicals, wax, sealants, cleaning products in the fiber. Korean manufacturers have recommended the use of “boiling” microfibers to ensure any of the dyes or contaminants from the factory are fully gone. Be careful of boiling timetables, limit up to 20 minutes. May fade dyes. Have Microfiber Streaking or No Absorbency Issues? If you find water sits on the fibers as blobs or beads or the microfiber “pushes” water, most likely you have a case of cross contamination. Fibers were either contaminated with the wrong chemical, such as an improper detergent or softener. Boil you microfibers and redo your washing regimen. Inadequate cleaning regimen can occur if your not using pristine laundry washer, which is leaving chemicals in microfiber. Also too much detergent will have an affect. start your normal laundry routine. Repeat if needed. Small Microfiber Load? Hand Wash them! Fill appropriately with HOT water. Empty water, fill with water and vinegar. No Bleach, Softener, or Ironing.